DOR's patented one-sided steering brace for 3rd gen (2003-2008 Ram 2500/3500 4x4) trucks is the steering support you've been looking for. It works with the factory steering box, any Borgeson box, or a Redhead box. 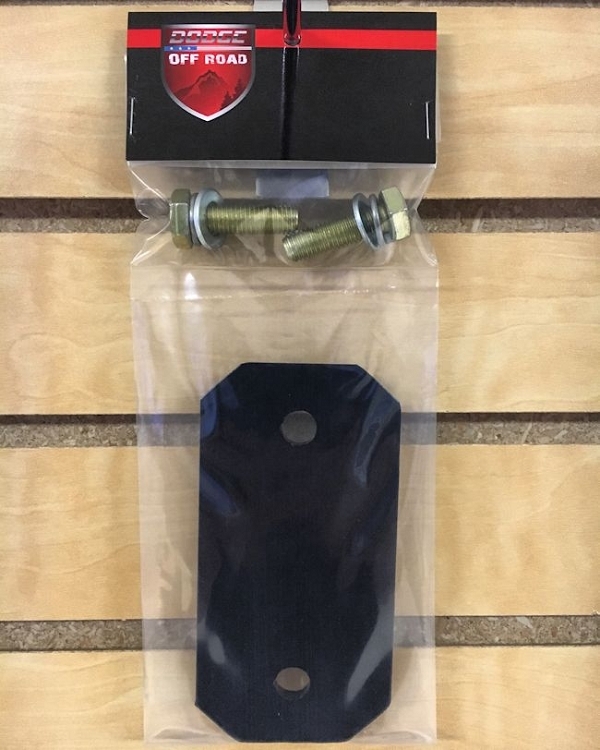 If you have the newer Mopar 08.5+ box (4th gen retrofit), you'll need to select that option so we send you the correct hardware - or you can just buy the 4th gen brace, which already has the larger hardware. These braces also fit the 2006-2008 1500 Mega Cab 4x4 models. We have built some adjustment into the brace so it will work on all models. 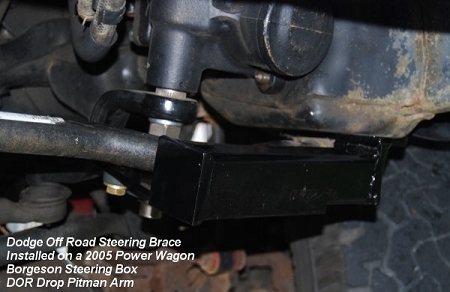 This brace works with Power Wagon sway bars, and was designed on our own 2005 Power Wagon. It also works with the DOR and other brand torsion sway bars. Made from all 1/4" steel with 1/4" wall 2" x 2" square tubing as the backbone, the DOR 3rd gen steering brace is a whopping 10.25 lbs of solid steering-support awesomeness. The concept is simple - don't fight what you can't control. There is not a steering brace on the market that will prevent frame flex at all, so what happens with all other steering braces is the frame twists and then the brace twists with it, putting that lateral motion directly into your steering box sector shaft thanks to the brace. Our braces are one-sided so they do not tie the frame rails together, thus preventing frame flex from ever affecting your steering box! This allows your steering box to be supported like it should be, without outside forces interfering. It's a very simple concept that we came up with years ago and have perfected over time. 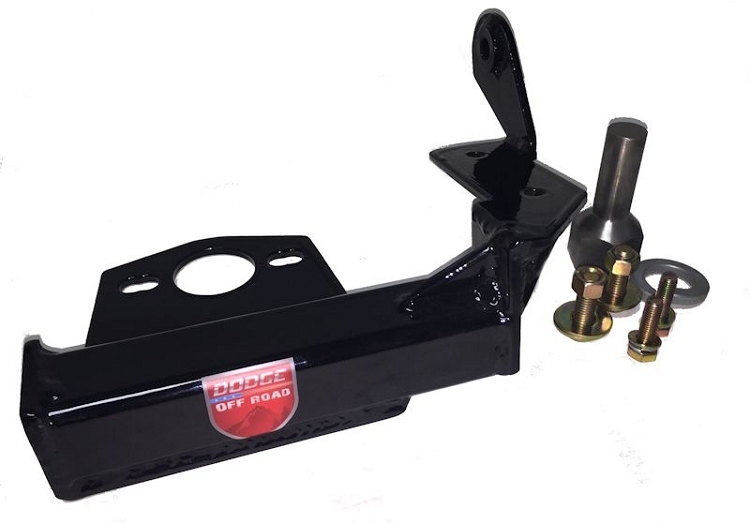 Even if your truck doesn't seem to have frame flex, why take a chance at ruining your expensive steering box when our brace is less expensive than other options and provides better support than a standard frame-to-frame brace? You gain nothing by running a frame-to-frame brace, because they do not stop frame flex and they are not easier to install. They are typically more expensive and use thinner materials with less support. This brace works on all trucks, from daily drivers to rock crawlers and everything in between. You do not have to have a rock crawler to experience the problem of frame flex. It happens everytime your truck is not on flat ground. 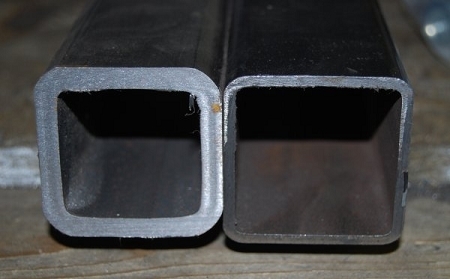 Your frame is two 18' long pieces of steel that are connected with various crossmembers every so many feet - there is no way that a piece of steel that long will not flex. 3rd and 4th gen trucks are much better than 2nd gens, but it still happens. Take a look at your body lines sometime when you park on an uneven surface, or go flex your truck and try to open the tailgate or doors. It becomes more difficult because things don't line up perfectly when the truck has some twist to it. Frame flex exists in every day situations. Our 3rd/4th gen brace works on all models including the Power Wagon, and bolts up in minutes with all new Grade 8 hardware (you reuse the factory steering box bolt). The bearings are high quality and greaseable for years of service, and are easy to replace when that day comes. We are the only company that uses stainless steel sector shaft extensions, rather than mild steel that is coated. Coatings wear off over time, but our stainless shafts will last forever and look good doing it. One of our competitors claims that a one-sided brace is a gimmick because the 3rd and 4th gen trucks do not have frame flex. Even if this were true, why would you buy a more expensive frame-to-frame brace that uses inferior materials, if our brace does the job, is easier to install, and does a better job of securing the sector shaft? Frame-to-frame braces do work, and we've used them ourselves for many years. The reason we came up with the single-sided brace is to get around the issue of frame flex, which was causing steering boxes to wear out just as fast as they were without a brace installed. If frame-to-frame braces work so well, then it seems like steering boxes wouldn't wear out once those braces are installed, right? What we experienced first-hand, and by talking to many people over the course of 10 years, is that while their steering was tighter when the brace was first installed, about a year or two later they were replacing the steering box again, which is about how long the box would last prior to having a brace on it. Many times, the boxes were leaking from the sector shaft, which is a telltale sign that the sector shaft is grinding on it's seal. Time will tell how much better our brace is at preventing that issue, but we can say that we've been building the one-sided brace since 2012 and we have yet to learn of anybody who installed it with a brand new box and has had to replace the box, unless the steering box was faulty or was damaged in a wreck. On our 2005 Power Wagon, we installed a Borgeson steering box and our DOR brace at the same time back in 2013, and even on 37" tires (and now 41" tires) it is still running the same steering box with no noticeable slop in the box. We have many, many customers that have told us the same thing. So again, if our brace does the job and costs the same or less, why wouldn't you give it a try instead of the typical frame-to-frame brace? You'll get a brace that is easier to install, uses much higher quality materials, and works on all steering boxes and sway bar setups. There is not another brace on the market that is as universal as ours, and that is because we built it to be this way. Most companies making these frame-to-frame braces barely have any experience with Dodge trucks, and they make parts for a bunch of other vehicles too. All we do is Dodge Ram parts, and that's all we've ever done. When you buy from us, you are buying from people who drive Dodge trucks and have tried out all of the other braces on the market. You're buying from a company with far more experience than anyone else. If you have any questions, please feel free to contact us anytime. This has to be one of the best parts I have ever put on my truck. I have a 2007 Ram 2500 that has had a ton of steering problems. I was sick and tired of the wandering feeling my truck had, it wouldn't even stay in it's own lane without constant attention. I really was ready to just sell the truck and get something else. I had put a new steering gear box in from PSC and they recommended that I use their steering brace too. It helped a LOT for a while, but 3 months later I was having the same problems. Come to find out the new steering box is worn out again! PSC was great and exchanged the box for me, but I started looking for other options to brace up the box without connecting both frame rails. I've heard that our truck frames twist and that can cause problems. I came across Dodge Off Road's single-sided brace and thought it was exactly what I was looking for. So for $150, I figured it was worth trying out to see if it was a gimmick or actually worked. That was 7 months ago and my steering box is still as tight as day one. Maybe the first box was just bad, but I really think it has more to do with the cross-frame design of the PSC brace. I've heard the same from other Ram owners. I think this is the hot ticket to keeping your steering box tight for a very long time. I'm just glad someone out there has the insight to build a brace that isolates the steering box - it seems like a no-brainer now, but apparently DOR is the only company to ever figure this out. Thanks for saving my truck!! I like many have had issues with the steering in my 06 Ram 2500 CTD. I finally figured out that my clicking and knocking on the front end was associated with the wandering of my truck and fighting it to keep it in my lane. 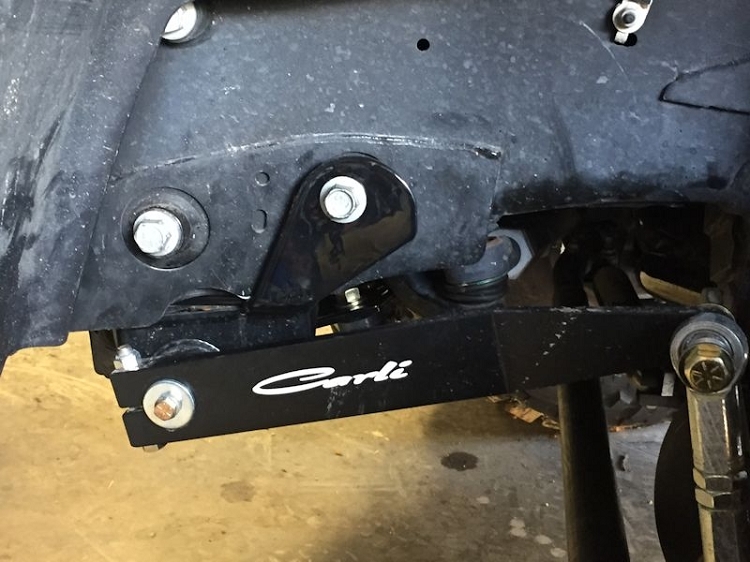 I put this on with a Borgeson Dodge box and shaft so I can't say exactly what this brace did alone, but I can tell you that the results were amazing. It's a night and day difference now. I should've done this when I first bought the truck. It's almost like driving a 7,000 pound 4 wheel drive sport car! As far as the brace, this seems like a high quality upgrade. Thick steel, beautiful looking welds, attractive looking powder coat, and high quality looking parts. I put this on just yesterday so I can't speak for longevity, but I would be surprised if this brace didn't last the life of this Cummins. Also, DOR shipped this extremely fast. It arrived with excellent packaging. I will do business with them again. After upgrading to the 09 steering linkage on my 07 power wagon it still had a bad wander/vague feeling, this brace really made it right, no more fighting the steering. Shipping was prompt and the install was very quick and easy. Q: When will the brace for the OEM stock steering boxes be available ?? A: We have a new version that will fit all steering box styles - Borgeson 800116, Borgeson 800121, Borgeson 800122, Mopar 08.5 box, and the factory Delphi box, all year models from 03-12. It is expected to be available on the site May 31st, 2014. Q: I recently had the steering gearbox replaced in my 2012 RAM 2500 4X4 (Cummins, A/T) because of sloppy sector shaft issues. The factory dealer replaced it with a gearbox that has 6 sector shaft top cover bolts instead of 4. I believe that this is the MOPAR steering box upgrade kit (w/ pitman arm) part # 68170214AA. Knowing this, will your DOR Steering Brace, part # 1019, fit correctly? Your dorp down menu gives the choices of FACTORY BOX, MOPAR 08.5 BOX, and the other two (Redhead and Borgeson) which I assume are not what I have. I really want your product, as it seems to be the logical choice for a steering brace that will not cause more problems. If the MOPAR 08.5 box is the same as my MOPAR part # 68170214AA, then that is the choice I will need. If there is another steering box out there for 2012 2500s that has 6 bolts on the top cover, then I may need some help figuring out which choice to make. Please reach out to me by phone or email when you can. As soon as I know the answer, I will immediately order the right part from you. I just had the entire steering system (gearbox, pitman arm, and all linkages) replaced by the dealer, and I want to beef it up before I wear it out again. The sad part is that I never leave pavement with this truck, and I want to fix these issues before I start going off-road and get stuck 20 miles from hardball. Thanks in advance. Have a good day. A: Thank you for asking. The Mopar 08.5 box can have either 4 bolts or 6 bolts on top. It's the same box, just made in different countries. There is more info on this on our forum under the FAQ section. From a steering brace standpoint, they are both the exact same box, so you'll just select the Mopar 08.5+ option. Our brace really does help keep the steering box from having the same issue that you just went through - regardless of how big the new boxes are, they are not built to have any side loading on the sector shaft. There is not enough internal support to handle that pressure. That's why it is so important to run a steering brace. Let us know if you have any other questions. Q: Will this brace work with the OEM power steering box? A: This version only fits the Borgeson 800116 or 800121 steering boxes; we will have a separate part number for the factory 03-08 boxes when those are available. They do not interchange, as the Borgeson boxes are larger than the factory box. Q: Will this fit the 2012 power wagon ? A: This brace doesn't fit the 2009+ trucks with the larger factory Mopar box; we will have a new version on the site soon that will fit the 2009-2012 Ram trucks, as well as the earlier models that have upgraded to the Mopar box. This particular brace fits the Borgeson box only. Q: In the near future I will be upgrading my steering linkage to the newer "T" linkage. At this time I'm only planning to upgrade to the borgeson box, shaft and box stabilizer on my 2005 Ram 3500. Will this stabilizer interfere with the upgraded linkage or can it be used with both the old and new linkage set ups? A: It will fit with any steering linkage without any interference. The pitman arm sits far enough behind the brace that the drag link would never come close to touching the brace. There is plenty of room for any steering setup. Our HD T-style setup fits really well, check out part number 1013 on here. Q: Do I need to change my stock Pitman Arm on my 2006 Dodge Power Wagon in order to install this brace? I see in the photos that the brace is installed on a PW but it is described as having a drop Pitman arm. A: You do not need to change your pitman arm for the brace to fit. It works with all steering boxes and all pitman arms. The significance of the drop pitman arm in that picture is that we made a custom drop pitman arm to fit the Borgeson 800116 steering box, which has been discontinued for a year or two. That's the only reason the drop pitman arm is even mentioned in that photo. Q: I have a 2004 3500 4x4 that I recently upgraded With the Borgeson 800123 Delphi steering gear unit. Which steering brace do I need? A: You'll want the Borgeson Box option.